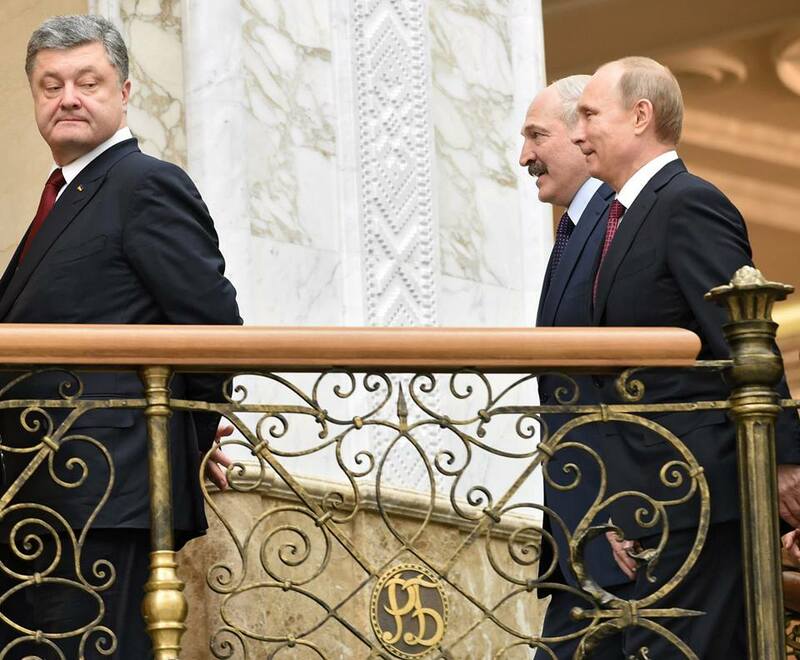 Minsk 2.0: The Road to Minsk 3.0 or a Bigger War? The Minsk 2.0 agreement is bound to be exceedingly difficult to bring to fruition and may even be destined to fail. Why? Because the signatories lack significant control over the conflicting sides on the ground in Ukraine. Because the parties, especially Ukrainian President Pyotr Poroshenko, came to the bargaining table as a consequence of having no other choice. And because the structure of the negotiations does not correspond to the structure of the conflict. First, the conflicting forces on the ground are not very amenable to commands from those who signed the agreement. President Pyotr Poroshenko might control the regular Ukrainian armed forces throught the Defense Ministry and General Staff in Kiev, but he does not control all or even most of the National Guard and its volunteer battalions supposedly subordinated to the Interior Ministry. For example, the leader of the neo-fascist Right Sector, Dmitro Yarosh, immediately responded to news of the agreement by declaring that his forces will not stop fighting in accordance with the ceasefire stipulated to be in full effect by midnight February15th. Right Sector has its own volunteer units and many of its members permeate neo-fascist battalions like Azov and Aidar, which have been tabbed by human rights organizations as having committed violations of human rights and laws of war. In addition, contrary to the propaganda slogans “Putin’s war,” “Putin’s aggression,” “Putin’s frozen conflicts” and their ilk, Russian President Putin does not control the Donbass forces. He can make their fight much more difficult by closing the border so Russian volunteers, soldiers, and weapons cannot reach the Donbass resistance forces, but that will not prevent them from fighting. They are highly motivated by dint of having been attacked by Kiev and will be destined to decades in prison should they lose the fight for autonomy. Obviously, the other signatory, the EU (represented by the signature of Ambassador Heidi Tagliavini and in the talks by German Chancellor Angela Merkel and French President Gerard Hollande), has no control whatsoever over forces on the ground. Second, the parties were motivated by immediate concerns and not the search for a lasting resolution to the conflict. This is likely most true for Poroshenko. Under any true peace accord, the embattled Ukrainian president will see his ruling coalition crumble and a likely coup attempt by elements within the ‘party of war’ – led by Prime Minister and national Front Chairman Arseniy Yatsenyuk, Security and Defense Council Chairman Alexander Turchynov, MVD chief Arsen Avakov, Radical Party leader Oleh Lyashko, and Fatherland Party leader Yulia Tymoshenko – and their radical allies in the Maidan regime like Right Sector, the Svoboda Party, among other neo-fascist groups. These groups are bent on violently returning the Donbass and Crimes to Kiev’s fold, despite Ukraine’s economic crisis, bankruptcy and an impending default. The Ukrainian treasury had enough currency reserves for another month on the eve of the Minsk conference, and the IMF was refusing to release a loan before a ceasefire is achieved. This meant that Kiev would have had no more funds to pay and fuel its already shaky military machine. One day after the Minsk 2.0 accord was signed, the IMF announced release of a $17.5 billion tranche. This and the promise of US advisors and training and the possibility of US weapons make continuing the war possible, though not inevitable. Poroshenko may still decide to implement the accords. If Russia and the rebels return the favor, then all is well. If they do not, then the West is sure to blame Putin, and Poroshenko will have a new jumping off point from which to parlay more Western economic, political, and military support. The impending catastrophe at Debaltsevo and the possibility, however unlikely, that the Obama Administration was seriously considering sending US weapons to Kiev may have concentrated some of the parties’ minds, at least temporarily. Third, the structure of the talks do not correspond to the structure of the conflict. It is at least a two-tiered conflict. The first is the conflict on the ground, the civil war between the Donbass and Kiev. Second is the geostrategic conflict between Moscow and the West, born of NATO expansion to Russia’s borders. As a result of this imbalance, loopholes were built into the Minsk 2.0 agreement. That the agreement’s weakness is driven by the incomplete structure of the negotiations as compared to the structure of the conflict is evidenced by the absence of a clause on one of the main internal causes of the conflict – the Donbass’s demand for federalization or autonomy. Since this is an internal issue of sovereign Ukraine’s institutional design, it can not be stipulated in a document signed by other states or international organizations like Russia and the EU. This is why a different structure that included all of the conflict’s parties on the ground is necessary. In this way, Putin (and perhaps others at the talks, we do not know) is correct in insisting that the leaders of the breakaway regions participate in talks and even sign the new agreement and that Poroshenko begin dealing with the separatist leaders or their representatives directly. Their signatures should have been secured. This weakness is also demonstrated by Russian Vladimir Putin’s statement that Russia can not fulfill the agreement’s clauses but can only serve as a guarantor. This is true for the EU as well. Moscow will not acknowledge the presence of its weapons or the small number of troops it has contributed to the defense of Donbass, and therefore it can only adopt the role of guarantor on almost all issues. Russia’s only somewhat open commitments are to close the borders and stop the supply of volunteers, soldiers and equipment, but these are interconnected and rest on the former, border issue. Both commitments, however, are mentioned in the agreement without reference to Moscow or Russia. Ukraine is, therefore, the only signatory-party to the new agreement that can actually carry out several of the requirements in the agreement, since the Donbass’s DNR and LNR refused to sign. Thus, the onus in carrying out the agreement as such falls inordinately on Kiev. Negotiations should be taking place simultaneously on the geostrategic tier between Moscow and the West over the issues that have driven the Ukrainian conflict. Differences between Russia and the West over NATO and EU expansion exacerbated the cultural, ideological, and geostrategic differences between eastern and western Ukraine, which peaked and exploded into violence on the Maidan as a consequence of the internal and external (Russia and EU) dispute over whether Ukraine should join the EU or EEU. It was curious that the issue of Ukraine’s non-bloc status established through a constitutional amendment was not included in Minsk 2.0. The upper-tier talks should therefore tackle two issues. First, the Russia and the West should agree and impress upon Ukraine that it should move towards military non-bloc status through a referendum and constitutional amendments. This will require the US to get involved in the Ukraine crisis’s resolution and abandon its passive/destructive approach that the Obama Administration has taken hitherto. Second, the EU and Russia should negotiate the design and implementation of the proposed free trade space from Lisbon to Vladivostok suggested by Chancellor Merkel or at least engage in trilateral talks with Kiev to smooth out the effects on the EEU of Ukraine’s accession to the EU association agreement. A key weak point in the agreement is the lack of a clause on peacekeeping troops. It seems it would be more effective to introduce UN peacekeeping forces on the ground in addition to OSCE monitors once the ceasefire is established and the withdrawal of heavy weapons is complete. They should be deployed both at the Donbass-Russian border and along the line of demarcation for the de-militarized zone designated in the agreement. None of this is to say that Minsk 2.0 is destined to fail. It is to say that too much is left to the good will and desire for peace among the forces on the ground. Unfortunately, the geopolitical and internal polarization within Ukraine is too high to expect that they suffice to overcome the tectonics of the conflict. That might mean the need for a Minsk 3.0 in order to avoid the ‘big war’ most seek to avoid. We are a week on and it sort of looks like it may work out. The reason for this is that Kiev has been beaten to more than a standstill by the SE militia, in my opinion. A rout, in fact. I base this on unsubstantiated reporting from the SE blogging side, but they have consistently proved to be telling the truth (albeit in colourful language) ..
Kiev was driven to the table at Minsk by the stout resolve of the SE militia and the lack of the hoped-for American military support for the Kiev junta. The Kiev loons believed the American hogwash and now they are stuck with it. Russia has always wanted a federation of Ukraine and seems to me they’ll get what they have prescribed from the beginning. Apparently some of the more sober minds in Washington recall that Russia is potentially an extremely dangerous customer. I believe that Russia, as always, would only fire the second shot, but they have mobile launchers all over the place and return of fire would erase Washington as a power. Ruin everyone’s day, in fact. And, Russia has genuine interests in the Donbass. Novorossiya may not come to pass, it will continue to be ugly, but we chalk one up for Moscow. Kiev now has an extremely unhappy meal to eat, which consists only of scraps from the EU’s table.